VINTAGE COSTUME ANTIQUE JEWELRY MATCHING JEWELRY SETS - PARURES! Art Deco Clear And Red Crystal Rhinestone Vintage Necklace And Clip Earrings Matching Jewelry Set - Parure for Weddings, Proms, Pageants And Parties! 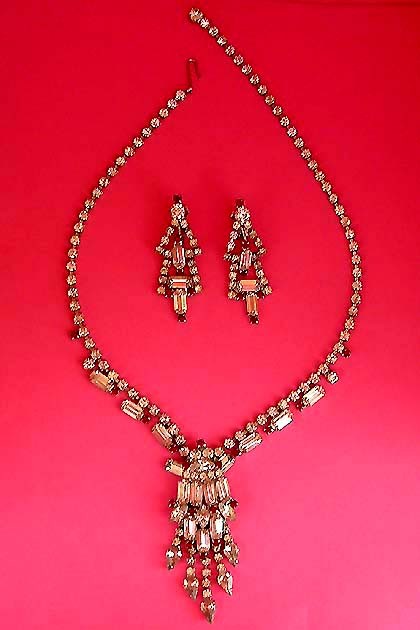 Item #S16848 - Art Deco Clear And Red Crystal Rhinestone Vintage Necklace And Clip Earrings Matching Jewelry Set - Parure. Size: Necklace - 17" and adjustable. Clip On Earrings - 2 1/4". Designer: UNSIGNED BEAUTY (Earrings marked PAT. PEND.). This ravishing crystal rhinestone Art Deco style necklace features gorgeous baguette, marquise and round crystal rhinestones. The theme of this necklace is the exquisitely beautiful waterfall drop. The drop is a diamond-shaped plaque of chunky baquettes and marquises tiering over five strands of rhinestones. The five shimmering waterfall strands have a sparkling teardrop stone tipping the end. 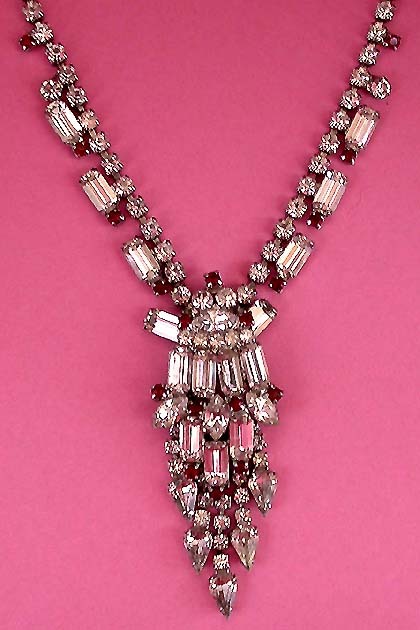 Each baquette or marquise is accented by a glitzy ruby red round rhinestone. That's not all it! Along each side of the necklace are more gorgeous baguettes with red rhinestone accent. 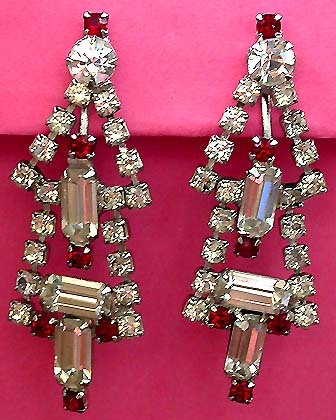 The matching earrings also feature sparkling baquettes and round stones with red stone accent done in an Art Deco design. Each baquette measures 1/4" x 3/8". The magnificent waterfall drop measures 3". All the stones are individually prong set on bright silver tone backing and emitting lots of sparkles and fire. One of the most exquisite Demi I have seen. Substantial in quality and drop-dead gorgeous! Excellent condition. A fabulous matching Jewelry set to wear at weddings, prom nights, pageants, parties, cruises and special functions! US$128.00. SOLD.